Q: What is Adaptogenic Calm? A: Adaptogenic Calm is the ultimate natural stress-fighting formula. The formula contains more of the top anti-stress nutrients than any other anti-anxiety supplement. It was designed to be a convenient alternative to traditional stress-fighting supplements, using the purest and most up-to-date, well-researched ingredients. Q: Who can benefit from Adaptogenic Calm? A: Anyone who feels that stress is interfering with his or her productiveness, effectiveness or enjoyment of life. We always recommend checking with one’s Primary Care Provider before adding any dietary supplement into their regime to cater to each individual’s needs. Q: Is there anyone who shouldn't take Adaptogenic Calm? A: Adaptogenic Calm was designed for use by virtually everyone. 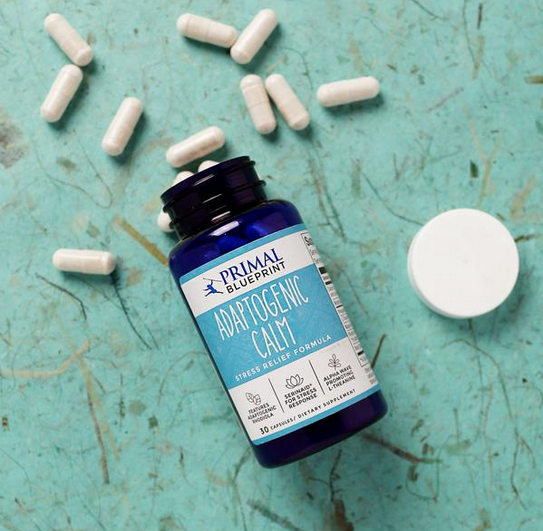 The ingredients in Adaptogenic Calm are all regarded as safe by the U.S. Food and Drug Administration. If you are under a physician's care, pregnant, lactating or taking prescription medications, we always suggest that you consult with your physician before starting any new supplement program. A: None of the ingredients in Adaptogenic Calm have been shown to produce side effects when taken as directed. Q: I have taken stress formulas before. How is Adaptogenic Calm different? A: Other stress formulas might contain stress-specific nutrients, but are often present in very low doses and almost never all together in the same all-in-one formula. Consequently, other stress formulas don't provide the true broad support your anti-stress systems require to deal most effectively with stress. Q: Will I feel "spacey" if I take Adaptogenic Calm? A: No, Adaptogenic Calm is a dietary supplement that works with your body's natural chemistry, providing raw materials and co-factors to support the structure and function of specific anti-stress systems so that your body can better achieve a more normal and healthy state. A: It will vary between individuals. A: Maintains optimum potency for up to 24 months from blend date. Q: Are the gelatin capsules vegetarian? A: No, they are derived from animal source. Q: Is there a better time to take it? A: There is no "right time" to take Adaptogenic Calm. It can be taken morning, noon or night, depending on when it's most convenient (with a little food is best). If you have a stressful day coming up, it may help to take some with breakfast. Q: What is cortisol and why is too much bad? A: Cortisol is one of the "fight-or-flight" hormones secreted by the adrenals in response to stress. Some cortisol is necessary for good health, but at high levels, it is associated with loss of muscle tone, increased fat deposition, immune suppression, depression, fatigue and reduced calcium uptake by bones. Q: Why did you choose magnesium oxide instead of magnesium citrate? A: Magnesium’s role in preventing heart disease and strokes is generally well-accepted. Low magnesium (Mg) intake is also associated with increased incidence of diabetes mellitus, metabolic syndrome, and all-cause mortality. Historically it has generally been thought that easily ionized forms of magnesium like magnesium citrate or aspartate are significantly better absorbed than magnesium salts like magnesium oxide. However, a new study challenges that position. In this double-blind study, researchers investigated the impact of supplemental oral Mg citrate versus Mg oxide on intracellular magnesium levels ([Mg2+]i) in healthy subjects. Healthy volunteers received either magnesium oxide tablets (520 mg/day of elemental magnesium) or magnesium citrate tablets (295.8 mg/day of elemental magnesium) for one month (phase 1), followed by a four-week wash-out period, and then crossover treatment for one month (phase 2). Using new analytical techniques (x-ray dispersion analysis) results showed Mg oxide produced a [Mg2+] I level of 36.3 mEq/L vs. 35.4 mEq/L for Mg citrate and reduced total and LDL cholesterol more significantly as well. Both forms also reduced platelet aggregation. Since the dosage of magnesium was also greater in the Mg oxide group, what these results indicate is that MG oxide is as suitable of a form of magnesium as Mg citrate when given at larger dosage levels. Approximately 500 mg of Mg oxide may be equal to 350 mg Mg citrate.